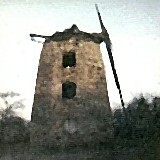 In 1976 whilst researching his book on Oxfordshire Mills mill enthusiast Wilf Foreman visited the near ruinous Wheatley Mill. 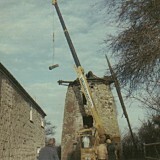 The mill was in a very poor condition with years of storm damage and disuse taking its toll, to a point at which the stonework was beginning to become unsafe. 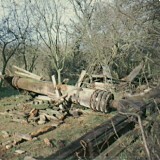 However Wilf was impressed enough with what he saw to suggest that the mill be restored. 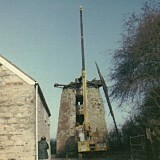 Shortly after this the Wheatley Windmill Restoration Society was formed to accomplish the restoration of the mill back to working condition. 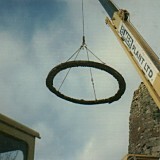 Before the stonework could be repaired the ruins of the cap and the cap running gear had to be removed. 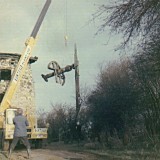 This was the first job to be addressed and it was completed in 1977. 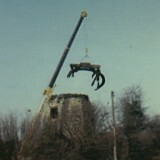 A large crane was moved up Windmill lane and with the Cap sides and Finial removed, the Windshaft, what was left of the Sails, and the Brakewheel were removed in one piece. Lastly the base of the Cap (the curb) was removed. 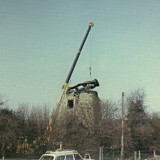 A view of the mill just before the operation is about to begin. 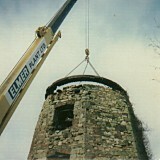 Preparing to lift the Windshaft, Brakewheel, and Sails. Moving the Windshaft, Brakewheel, and Sails clear. 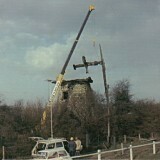 Lowering the Windshaft, visible is the damaged Brakewheel. 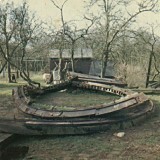 The Windshaft and now disintegrated Brakewheel. The lift of the curb begins. The curb is lifted as one piece. The remains of the curb reach the ground. 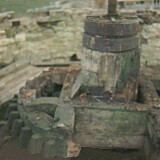 View of the top of the mill with the Wallower exposed.